Pandorea pandorana vines are members of the Bignoniaceae family and are natives of Australia, Malaysia and the southwestern Pacific region. The Wonga – Wonga vine is a vigorous evergreen climber that is a hardy fast-growing plant that likes full sun but will tolerates some shade. This is a climber that can climb trees 10 metres off the ground if given the opportunity. The plants have a natural bushy habit but pruning may be needed to keep them to a desired shape and form. Excellent for training on a trellis, fence, tree or buildings. 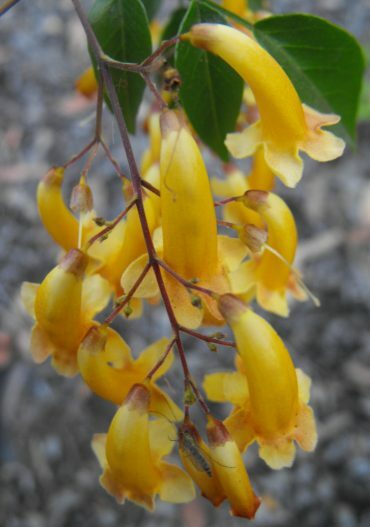 The flowers of the gold form are tubular bell-shaped flowers (hence the promotional names as the Belle varieties) are about 25mm long and are produced in masses in spring.